or other unforeseen event which may occur. to the environment, and the conduct of riders and other persons. saddles may slip and other riders who may not control their horse. and accept that accidents can happen! Horse riding can be a high risk activity. Horses are sometimes unpredictable in some circumstances and they can react to the environment, and the conduct of riders and other persons. Very occasionally horse riding can involve equipment that may break, saddles may slip and other riders who may not control their horse. Every precaution has been taken to minimize the associated risks, however horses can be unpredictable animals so please take care, listen carefully to instructions and accept that accidents can happen! Age (If under 18) ………………………………………………………………………….. Emergency Contact Name & Tel. No. ……………………………………………………. 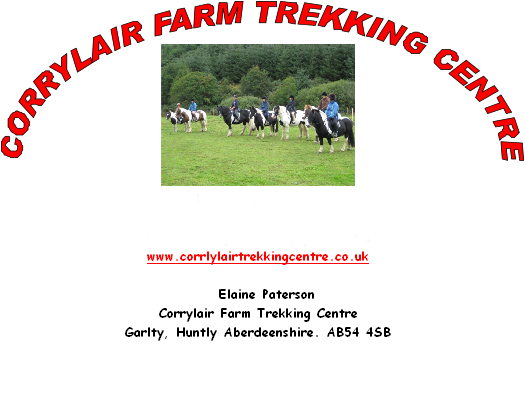 The following information is confidential and is intended to assist Corrylair Trekking Centre in case of emergency. Any learning difficulties need to be discussed to enable instructors to accommodate accordingly. Do you have any pre- existing medical condition or disability that may place you or any other rider at risk? Yes ⁯ No ⁯ Details…………………………………………………………………. Year of last Tetanus (Within last 5 years) ……………………………………………..
Where the person in charge is unable to contact the emergency contact I authorize the person in charge to administer first Aid and call an ambulance if judged to be reasonably necessary by the person in charge. Parent / Guardian signature (if under 18) ……………………………………………..